Summer always makes me remember packing up our car and heading out for an adventure. As a child, we drove throughout the western states visiting national parks from Glacier Park in Montana to the Grand Canyon in Arizona. A fun spin on summer road trips is Punk Farm On Tour , by Jarrett J. Krosoczka. It's high energy fun with a healthy dose of imagination that young kids will dig! Punk Farm's travels take them from Maine to Florida to Colorado, as they go from gig to gig. This book lends itself to great imaginary play for energetic little dudes, whether they create their own animal jam band, or take an imaginary road trip. I love Krosoczka's energy, artwork and imagination - rock on! If you like the sound of this, definitely check out the original Punk Farm book by Krosoczka. Two other fun animal series are Doreen Cronin's Click, Clack, Moo: Cows That Type and Denys Cazet's early reader series Minnie and Moo (check out Minnie and Moo Go To Paris for some hilarious travels). The review copy came from our local library. Celebrate reading this summer by spending some time at your local public library! Children love listening to the wild chase in the classic folktale The Gingerbread Man , and many teachers read this folktale and its variations to preschool and kindergarten classes. I was thrilled to discover The Gingerbread Man Loose in the School , by Laura Murray - it combines a fun story with great rhyme and rhythm, one that will be perfect for reading aloud at the beginning of the year! As he tells in this delightful story, the gingerbread man is put together by a classroom full of kids. But as soon as he comes out of the oven, the children all go outside to recess. And so begins a familiar chase, but this time the gingerbread man is chasing the class, instead of the familiar animals chasing him! the children who made me, but left me behind!" Laura Murray combines good-natured humor with lively, dynamic rhythm and rhyme in this story that begs to be read aloud. The gingerbread man's adventures take him on a tour of the school: to the gym, the art room, the principal's office. In each place, he meets the teacher who helps him follow his class. This story lends itself perfectly to kindergarten classes just getting to know their new school, or preschoolers looking ahead to a larger school. In fact, Laura Murray has a great collection of related activities on her website. At its heart, though, this book will be a favorite because of the great read-aloud quality to the language that Murray has used. Mike Lowery's art also has great appeal, with panels and drawings that draw on comic book traditions. Kids will enjoy the bright colors and funny drawings, which fit both the folktale and school themes. The drawings are detailed enough for repeated readings, but are not overly busy and crowded. They are perfect for this audience and story. I purchased the review copy from one of our local independent bookstores: Diesel Books in Oakland, always with a great selection of new children's books. Many of our students are drawn to realistic fiction because they see a slice of themselves or their friends in the stories they read. A new book I'm looking forward to sharing with students is Dancing Home, by Alma Flor Ada and her son Gabriel Zubizarreta, which tells the story of two cousins, one raised in the U.S. and the other in Mexico, and how their lives begin to intertwine. Margie works hard to fit into her 5th grade class in California. She loves sitting in the front of her class next to her best friend, Liz. But all that changes the day that Margie has to bring her cousin, Lupe, to school with her. Lupe has just arrived from Mexico to live with Margie's family, and the principal insists that she should join Margie in her 5th grade class. Margie tries to tell her teacher that she doesn't really know much Spanish and won't be able to translate for Lupe, but none of the adults seem to understand. Even though Margie's parents were born in Mexico and speak Spanish at home, Margie has been speaking mainly English since preschool. Dancing Home follows both Margie (originally Margarita) and Lupe as they come to know each other. Readers are brought into both of their experiences, and will appreciate the author's kind, caring tone throughout the book. I know that many children in our school will relate to the experience of being caught between two cultures, trying to figure out where you belong, what to claim as your own. The character development in this story is heartfelt and genuine; the authors don't shy away from difficult topics of identity and immigration, but they also talk about them from the children's point of view. Kids will appreciate how hard it is to make changes, to adapt and fit into a new environment, and to figure out your own identity. At times, I wished that the authors showed more of the character's interactions, rather than relying on telling us about their feelings. But I don't think children who enjoy realistic fiction will be bothered by this. The strength of this story is sharing these girls' story, giving us people we care about who are struggling with situations we can relate to. I have long admired Alma Flor Ada's work, both picture books and chapter books. One of my favorite chapter books to recommend to 3rd graders is: My Name Is Maria Isabel / Me llamo Maria Isabel. The review copy was kindly sent by the publishers, Simon and Schuster / Atheneum. Alma Flor Ada will be a guest speaker at the United States Board on Books for Young People Conference, at Fresno State from October 21-23, 2011. This is an incredible book with photographs to trick your eye. Steiner assembles mini-sets using household objects to create 3D scenes of famous landmarks. So in this cover image, she's used garlic and onions to make the domes, upside down recorders to make the minarets, and brussel sprouts to make the ornamental trees. Kids spend hours trying to spot the everyday objects she's used in these clever scenes. If you have a kid who loves the I Spy series, definitely check out Joan Steiner's books! I'm excited to see Look-Alikes: Seek and Search Puzzles , her newest book. Junie B. 's These Puzzles Hurt My Brain! The Junie B. series continues to be popular with students at our school, appealing to kindergarteners who beg their parents to read it aloud to them, as well as new readers in 1st and 2nd grade. Above all, they love Junie B. 's sense of humor as she encounters situations kids can relate to. My 1st grader has loved this activity book. It's packed with dot-to-dots, word games, spot-the-difference pictures, Mad-Lib like fill in the blank stories, word searches, and more. And I really mean more! We've gone back to this book again and again, and there are still so many pages she hasn't done. With over 200 puzzles, this is a great book for kids who are just finishing kindergarten, 1st and 2nd grades. Each double-page spread features a scene with bright, cheerful illustrations. Around the edges are small labeled illustrations with a number attached. So for example, "On the farm" you start hunting for 3 puppies, 5 ducks, 9 ducklings, 8 black lambs, and so on. The illustrations are busy but even young children can have success finding the items. The amazing thing is that 3 year olds love this, and so do 9 year olds! They are fun visual puzzle that are both easy and challenging to do. Do you have any fun activity books that your kids especially like in the summer? Please share! The review copies came from many sources. Look-Alikes Around the World came from our local library; Random House kindly sent us a review copy of Junie B. 's These Puzzles Hurt My Brain! ; and, I purchased The Usborne Big Book of Things to Spot for our vacation! I love getting drawn into a fantasy world that is intriguing but not terrifying, exciting but not too dark. Zita the Spacegirl, by Ben Hatke, is a wonderful new graphic novel that is going to be a huge hit with our 4th and 5th graders. Students have really enjoyed this book, recommending it for readers who like adventure and fantasy. Zosia said, "It was hard for me to put down because I wanted to find out what happened next. I was so curious about what was going to happen, especially when Zita's friend got sucked into the other world." Zita is just your ordinary girl, spending the afternoon with her best friend Joseph, when they stumble across a giant pit left by a meteoroid. They find a device with a bright red button, and Zita knows she just has to push it. "Noooooo!!!" cries Joseph. But, come on - it's a big red button! It might as well have a "drink me" tag attached to it. Suddenly, a hole appears in space, and giant tentacles reach out and grab Joseph! Zita is shocked and distraught that she pushed the button, causing her best friend to be yanked out into who-knows-where. But she leaps to the rescue and follows Joseph into this new world. Zita finds herself in this strange new planet, filled with neurotic robots, giant clay creatures, and humanoid chickens. Zita must find her way in this new world, figure out where Joseph might be and who might help her rescue him. She launches into a classic quest with determination and courage. You can also look at a preview of the story here, thanks to FirstSecond books. If you have a child who adores graphic novels, keep your eye out for FirstSecond Books. They consistently produce a wide range of graphic novels that draw children into stories. I purchased a copy for my home library collection and for our school library. Follow Ben Hatke's blog here - I'm hoping for another installment of Zita's adventures soon! If you make a purchase using the Amazon links on this site, a small portion goes to Great Kid Books (at no cost to you!). Thank you for your support. 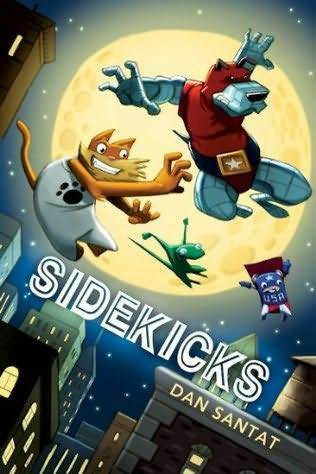 Superheroes, pets, friends loyal to the end, and illustrations with enough POW to knock your socks off - it's a winning combination for the new graphic novel Sidekicks, by Dan Santat. I predict that young kids are going to beg their parents to read this aloud to them, and older ones are going to read it again and again, relishing in the action, the exciting story, and the multi-layered details. If you have a child who loves superheroes or comic books, definitely check this out. Roscoe the Dog and Fluffy the Hamster might seem like ordinary pets, but don’t let appearances deceive you! They’re the loyal pets of Captain Amazing, protector of Metro City, hero far and wide. But Captain Amazing is having trouble these days, and needs to bring in a new sidekick. He’s determined not to have his own pets serve as a sidekick because of a painful experience years back, and now he just wants to spend time at home. He’s even bought a new pet, a chameleon he names Shifty. But these pets are just as determined to prove their own worth and become Captain Amazing’s new sidekick. So they set out to fight crime throughout the city and learn how to use their own superpowers. With exciting writing and dramatic illustrations, Dan Santat has created a graphic novel that will have kids hooked from beginning to end, reading it again and again. This story will appeal to both girls and boys because it’s got just the right blend of action, adventure, friendship, humor - all with just the right level of fighting to make the story exciting but not too violent. One child told me it’s “an edge of the page sort of book,” with cliff-hangers that hook you in and make you want to keep reading. This is graphic novel writing at its best, with interesting details in the illustrations, snappy dialog and compelling characters - a story kids will want to read many times, discovering new story elements each time they read the story. It will pull kids in with bold colors and humor, but it will immerse them in a well-developed superhero fantasy, with detailed setting, compelling plot, and characters that you care about. This will make a great read aloud for younger kids, or perfect independent read for middle grade readers. Take a look at this fun book trailer. It gives a great sense of what the book’s about and the art style. If you like this, you’ll want to explore other books illustrated by Dan Santat, like the whacky Oh, No! Or How My Science Project Destroyed the World and one of my student's favorites of the year: Attack of the Fluffy Bunnies. You’ll also like adventure graphic novels like Rapunzel’s Revenge by Shannon Hale or Into the Volcano by Don Wood. We’re certainly hoping that Dan Santat has more adventures for Roscoe, Fluffy and Shifty in the works! The review copy was kindly sent by the publishers at Scholastic, but I’ve already purchased three copies for our school library. I predict that they’ll be out constantly, and kids in grades 2 through 5 pass it from friend to friend. Definitely explore Dan Santat's great website to find out more information about this great book. You can also follow his adventures on Twitter. Yesterday, I watched a little girl follow a butterfly around a mountain pond as it flew from flower to flower. She was absolutely captivated by this little yellow butterfly, and I couldn’t help smiling watching her fascination. A wonderful new book to share with your children is A Butterfly Is Patient, by the award-winning team of Dianna Hutts Aston and Sylvia Long. This beautiful book combines captivating, detailed watercolor illustrations, poetic descriptions and clear explanations of butterfly life cycles, behavior and body structure. As you open up A Butterfly Is Patient, you discover an army of caterpillars (yes, that's the plural noun! ), with over 30 species from the Spotted Fritillary to the Malay Lacewing, creeping along twigs and leafs, illustrated in Sylvia Long’s clear, vibrant watercolors. Children will be fascinated by the sheer variety of these different caterpillars, and drawn into this book immediately. Each species is labeled clearly throughout the book, so readers can compare the different stages of the same species. This book invites children and their parents to explore the variety and complexity of butterflies, and is perfect for summer reading as children connect what they see outdoors with what they can explore through their reading. A Butterfly Is Patient follows the same pattern that Aston and Hutts developed with their award-winning books A Seed Is Sleepy and An Egg Is Quiet. Each double page spread combines poetic descriptions written in large script, with clear concise nonfiction information, all illustrated with sumptuous watercolors. This format works wonderfully for many different ages, capturing the interest of young children as they look at the vibrant pictures and absorb the poetic descriptions and start to learn the scientific information, and engaging older children as they seek out details in the illustrations and master the scientific facts. This book will work well as a read aloud at home or in the classroom for younger children, and as a book that children will return to as they explore the different facets of information in the drawings and text. You can see a preview of this wonderful book at this Scrib’d site or the Chronicle Books site. I found the description of a butterfly’s “shiny, powdery scales” particularly interesting. Aston explains that “without scales, (a butterfly’s) wings would be as transparent as the wings of a bee or dragonfly.” These scales help form the patterns on the butterfly’s wings, but they also can help keep a butterfly’s wings the right temperature for flying by absorbing heat from the sun. As you turn the final page, you discover that the caterpillars from the beginning have all turned into adult butterflies, now a rabble of butterflies! Each one is meticulously painted and clearly labeled - perfect for the budding naturalist and backyard explorers to match with the caterpillars from the beginning pages. It would be fascinating to have children compare A Butterfly Is Patient with Nic Bishop's Butterflies and Moths, comparing the information and the effect of photographs and watercolors. You can find more activities for your young naturalists at the site Growing With Science. They have several specifically exploring caterpillars and butterflies. I do wish that this book had included a map letting readers know where these different butterflies live. This really does straddle between poetry and science, clearly drawing on both to engage readers. But I always find maps help children place animals in our larger world, providing concrete information about where they live. A Butterfly is Patient has received starred reviews from School Library Journal and Publisher’s Weekly. You can also read reviews at Wrapped in Foil and A Patchwork of Books. Nonfiction Monday is a great resource for finding out great nonfiction books to share with your children. Today it's hosted by Brenda at ProseandKahn, a blog full of great resources for parents, teachers and librarians. The review copy was kindly sent by the publishers, Chronicle Books. I also recommend seeking out Aston and Long’s previous books, A Seed Is Sleepy and An Egg is Quiet. First birthdays are a special celebration, one that families remember for a long time. What Will You Be, Sara Mee? is a lovely look at a Korean tradition, and will delight children. As Chong greets his baby sister Sara Mee the morning of her first birthday, he asks her, “What will you be, Sara Mee?” It’s a special day for Sara Mee. Her Korean American family is gathering to celebrate her tol, or her first-birthday celebration. There will be food and presents, but most exciting is the traditional Korean game, the toljabee which will predict what she will be when she grows up. Chong, her older brother, is especially excited to see see what Sara Mee will pick from the table. Their halmoni, or grandmother, opens the special family box and Chong takes out the special items one by one. Kate Avraham’s sweet story builds to a satisfying conclusion, and Anne O’Brien’s illustrations are full of warmth and togetherness. This is a special book for any family celebrating a little one’s special birthday. For other reviews, check out The Book Dragon and Waking Brain Cells. The Book Dragon had some interesting comments on the presentation of Korean words, noting that Avraham uses an outdated, jarring method. But the feelings and sentiment behind the book still make this valuable and delightful. The review copy came from our school library. Kids love comic books and graphic novels. They're drawn in by colorful illustrations, but they love the stories and the interaction between illustrations and text. Balloon Toon books combine simple text and panel illustrations in these stories perfect for early readers. You need to read the pictures as much of the words to follow the development of the story, a perfect task for new readers. I have found the Balloon Toon collection a bit uneven, so I would like to my thoughts on some of these books. Rick the Raccoon is your typical young kid who’s just not quite sure about the Great Outdoors. Fishing? It’s boring. Hiking? It takes too much energy! 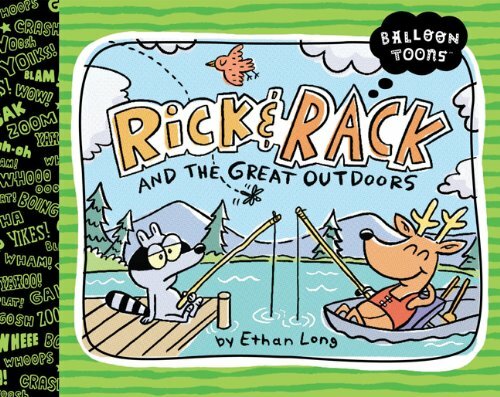 His friend Rack the Deer is determined to show him all the great things he loves: fishing, canoeing, and hiking. These friends remind me of classic pairs like Frog and Toad or George and Martha, bickering a bit but ultimately encouraging each other to try something new. 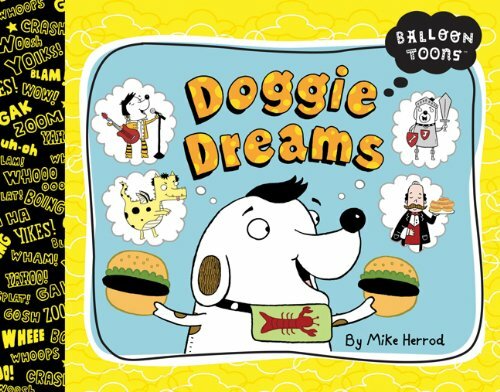 This graphic novel is designed with engaging cartoon art and simple words to attract and encourage new readers. Rick the Raccoon is your typical young kid who’s just not quite sure about the Great Outdoors. Fishing? It’s boring. Hiking? It takes too much energy! His friend Rack the Deer is determined to show him all the great things he loves: fishing, canoeing, and hiking. These friends remind me of classic pairs like Frog and Toad or George and Martha, bickering a bit but ultimately encouraging each other to try something new. The cartoon format will appeal to young kids, with bright colors, simple text in speech bubbles and silly humor. This graphic novel for young readers is very fun, combining simple text, colorful cartoon illustrations and a fleshed out story that kids can relate to. 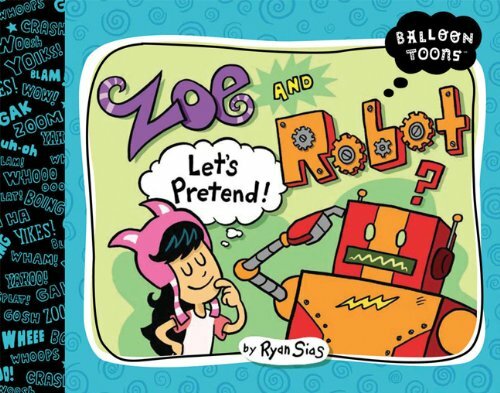 Zoe is a young girl who wants to play with her friend Robot. Zoe suggests they go mountain climbing, up a huge pile of pillows. Robot insists time and time again that he can't see any mountain. Robots can't pretend! This delightful book reminded me in some ways of Green Eggs and Ham, with a young child trying to coax a grown up to play and try new things. We are big cat lovers in our family, and so I was looking forward to reading this book. The story is fun and silly, but there wasn't quite enough "there" there for me. It really seemed a bit disjointed to me. 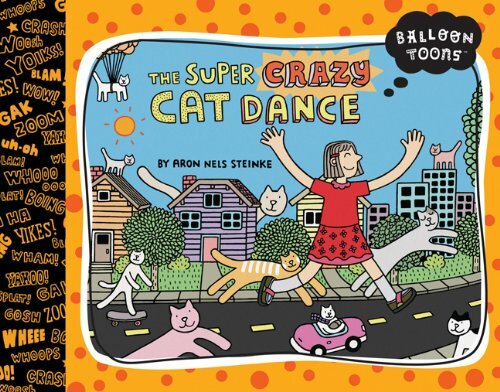 In the beginning, it's rhyming ode to cats, but then it turns into a lesson on doing the cat dance, and concludes with a trip to the moon. The illustrations and cartoon format will certainly appeal to new readers. It will be interesting to see if this is a book kids check out and recommend to friends. This story is fun, but not very substantial. Kids will enjoy the bright illustrations and wacky humor. The text is easy to read and well laid out for new readers. But the stories just fall a little flat, relying on silliness that doesn't really stay with me. It's a fun read, but not one I can see staying with kids. Have you read any of the Balloon Toon books? I'd love your thoughts on these, or other comic books for new readers. The review copies were kindly sent by the publisher, Blue Apple Books. Throughout this spring and summer, the news has been full of tragedies striking communities throughout America and across the world. Floods, tornadoes, earthquakes, rainstorms have swept away homes and disrupted lives around the world. As I've listened to each story, I've thought about how children and families have been affected, losing their homes, their communities, all that is stable in their lives. One reason I love children's books is the way they help us develop empathy with other people. I recently read a touching story of a young girl who is recovering from losing her home in a hurricane: Ellie Ever, by Nancy Ruth Paterson. It works well either to read aloud with kindergarten through 2nd graders, or as a short chapter book for older children to read. After losing her father and all their possessions in a hurricane, nine-year-old Ellie and her mother must figure out how to pull their life together again. At first, they live in temporary housing in a church, and Ellie begins to think of things "BH" and "AH", or before the hurricane and after the hurricane. And then one of the church members helps them find a fresh start - a job and home on a horse farm in Virginia, and a scholarship for Ellie at an exclusive girls' school. Ellie struggles to fit in at this new school, not really knowing why the girls don't seem to like her. But when her new classmates think that she lives in a mansion and is a princess, she lets this misunderstanding go unresolved and the rumors grow. Ellie is conflicted about what to do - she knows that she should tell her classmates the truth about where she came from, but she also enjoys the attention and new friends. Children will be drawn in by Ellie's love for horses, but they will really enjoy the emotional connection they develop with Ellie. It is a chance for readers to think about what it would be like to lose everything - your father, your friends, your home, all your possessions - and start over, making new friends and building a life for yourself. Ellie and her mother are optimistic, no-nonsense characters, ones that think about things but don't let them get them down. This is a great choice for kids who like realistic stories that are thoughtful, but not too heavy. The review copy came from our home library. It was also reviewed by The Spine Label, where Julia wrote, "This is a sweet (without being too saccharine) story about staying true to one’s self." I was inspired by the panel discussion presented by the United States Board on Book for Young People (USBBY) at last week's American Library Association annual meeting. USBBY is the American regional section of the International Board on Books for Young People (IBBY), and last week's session was entitled, “Independent Publishers-International Children’s Books.” Representatives from four US independent publishers shared their thoughts on international books. Groundwood Books, Kane Miller Books, NorthSouth Books, and Chronicle Books each shared about their particular vision, story, and favorite titles. And so I left the ALA meeting inspired to share more international books with my students, talking about what makes these books feel different, but also what brings us together as we look at these books. I am also inspired to join the USBBY, an organization I have been wanting to join for some time now. For those who are interested, a wonderful resource is the USBBY Outstanding International Books List, available online.